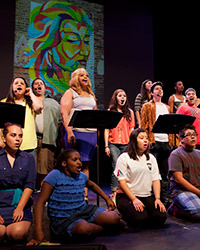 Infused with salsa, rap and hip-hop, a concert version of the Tony award-winning musical In the Heights was presented by Chicago Shakespeare Theater, Benito Juárez Community Academy and Latinos Progresando on April 8. This theatrical celebration of the drive and dreams of Latino immigrants in the Washington Heights neighborhood of Manhattan performed to a sold-out house at Benito Juárez Performing Arts Center. The concert’s energetic score was orchestrated by musicians from the Cerqua Rivera Dance Theater’s Musical Ensemble and performed by local artists from the Pilsen, Little Village, Back of the Yards and Lawndale neighborhoods. Directed by Cecilie Keenan, the production also featured artwork by muralist Pablo Serrano and photography of the Pilsen neighborhood by Michael Litchfield. This project was the first co-production to be staged by these three instututional partners, strengthening CST’s ongoing relationships in the greater Pilsen community. Over the past three years, the work of our artists has been introduced to new audiences through special engagements with Benito Juárez Performing Arts Center and free Chicago Shakespeare in the Parks performances. Meet the artists involved by exploring the program book. Pictured: In the Heights Concert in Pilsen. Photo by Michael Litchfield.